This copper 110 shim stock roll is cold rolled and annealed. It is made from copper 110, which has good malleability and ductility as well as high electrical and heat conductivity. It is easily cold worked, formed, or plated, and is well suited for electrical applications. This shim stock is sold in rolls for cutting, stamping, milling, and shaping into shims of various sizes and shapes. It is is magnetic and cannot be hardened through heat treatment, and it complies with United States Military (MIL) standard C12168 and Copper Development Association (CDA) standard 110. Cold rolling is a metal-forming process in which a sheet of material is passed between two rollers and compressed in order to reduce the thickness of the sheet. This copper 110 shim stock is cold rolled, which improves the yield strength, hardness, surface quality, tolerances, and dimensional accuracy of the material. Tempered metals and alloys are either strain hardened (also referred to as cold worked) or heat treated in order to improve their toughness. 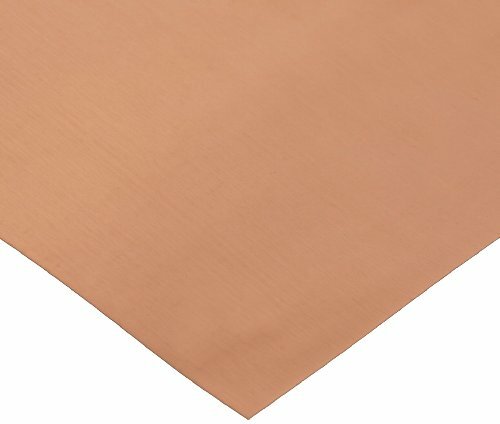 This copper 110 shim stock undergoes an annealing tempering process in which the metal is heated to a specific temperature or color and then allowed to cool. Annealing improves the ductility of the metal and allows it to be more easily formed and cold worked. A shim is a thin piece of material placed between objects for a variety of uses, including added support, improved leveling, increased insulation, tighter sealing, and better spacing. Shims can also be used to fill in gaps between parts that are prone to wear. Shims are used in processes such as automobile and machine tool manufacturing, construction operations, musical instrument production, and computer engineering. Shim stock is a thin sheet of metal or plastic that can be cut, sawed, stamped, milled, or bored into shims of various shapes and sizes to suit a wide range of applications. Shims can be made from almost any material, such as wood, paper, metal, stone, and plastic. However, commercial shim stock is either metal or plastic. Specific properties of shim stock, such as magnetism, hardness, temper, yield strength, chemical reactivity, corrosion resistance, and conductivity, are dependent on base materials and any finishing processes that have been applied, such as tempering, rolling, or surface treatments. Shim stock is sold in rolls or sheets of varying lengths, widths, and thicknesses. Slotted shim stock is precut for improved accuracy in alignment and leveling. Laminated shim stock is produced in sheets of stacked, pressed layers of metal foil that can be peeled apart to adjust the sheet thickness. Shim stock conforms to American Society for Testing and Materials Standards (ASTM), Society of Automobile Engineers International Standards (SAE), SAE Aerospace Materials Standards (AMS), United States Military Standards (MIL), Copper Development Association Standards (CDA), and the American Iron and Steel Institute Standards (AISI). 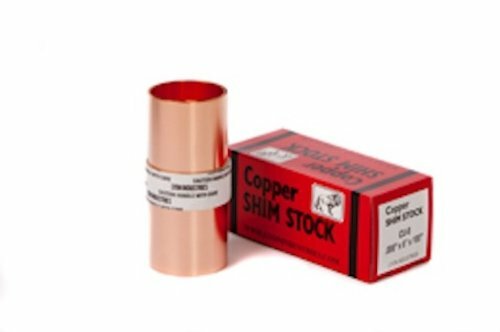 The copper 110 shim stock roll is made of a highly conductive, corrosion-resistant metal. Considered the standard copper alloy, this nonmagnetic material contains a minimum of 99.90% copper and has a minimum conductivity rating of 100% IACS (International Annealed Copper Standard). The material has been annealed, a method of heating and cooling a material to reinstate its formability after it has been processed into a shape. This roll conforms to the American Society for Testing and Materials (ASTM) B152, SAE Aerospace Materials Standards (AMS) 4500, and Federal Specification (Fed. Spec.) QQ-C-576 standards. Shim stock is fabricated by cold rolling, which is the process of reducing a material s thickness by passing it between two rollers. Cold rolling can cause a temper to form in the material, increasing the yield strength (the amount of force necessary to permanently bend or deform the material) as well as hardness ratings of the material. The higher its hardness and yield strength ratings, the more likely the shim is to preserve its thickness and shape over time while in use, but the harder it will be to bend and shape. Quarter-hard tempered material provides the lowest hardness and yield strength ratings and the greatest ductility of the tempers, with half-hard, three-quarters-hard, full-hard, spring, and blue tempered material respectively increasing in hardness and yield strength. Annealed shim stock has been heated and cooled to remove any temper and reinstate the material s natural formability (ability to be bent) after it has been cold rolled. Shim stock, which is sold in either sheets or rolls, is a very thin material that can be cut, sawed, stamped, milled, or bored into specific shapes. These fabricated pieces, also called shims, can be placed between objects for a variety of uses, including added support, improved leveling, increased insulation, tighter sealing, and better spacing. Shims can also be used to fill in gaps between machine parts that are prone to wear, avoiding costly replacement parts and lost production time. While most shim stock is sold in standard thicknesses of solid material, shim stock with laminated layers is composed of stacked foil sheets that have been pressed and heated together and that peel off to adjust the shim s thickness to the application. The 110 copper round shim has an unpolished (mill) surface, meets American Society for Testing and Materials International ASTM B152 specifications, and has a standard tolerance. The 110 copper alloy has high electrical and thermal conductivity, and offers good corrosion resistance. It is nonmagnetic.